Wessler: When did you start using social media? Grant: In a previous job, I used the radio to reach residents; social media has since replaced the radio. My first attempt at social media was in my last job where I wrote blogs and had my own Facebook page. Wessler: Why do you use social media? Grant: Social media is simply a vehicle to further my goals and mission. To move Brownsburg forward, I need the support of others to get the job done, and social media helps with this. When [residents] think of [government], they think of everyone (school, library, etc. ), but each of these are separate entities with a different set of goals. Through social media, I am able to help people understand what government does while achieving my three goals: inform, engage, and influence. Inform: I give information so residents understand the issues and goals. This can be challenging because not all the news is good; sometimes we use Twitter to talk about failures or projects over budget. Engage: Social media is a quick, easy way to ask questions. People want a voice, and I want a discussion because it is the lifeblood of a strong community. I want people to know that our community is their community. Influence: Social media provides an avenue to share the town council's thoughts about issues and why particular decisions are made. Wessler: How is your use of social media beneficial to the Town? Does it help bridge the gap between you and Brownsburg residents? 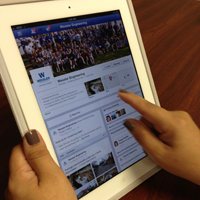 Grant: Social media helps educate residents. Several residents have approached me and said “I know more about government since you’ve been tweeting.” I am a numbers guy, so I love to analyze and compare. I like to help people understand the debt per capita or the new budget proposal, and social media is an easy way to share this information. People become more engaged, interested, and concerned. Social media is a way to let others know I am a part of the community. I am one of them. I am a Hoosier. I live here, eat here, shop here, and my kids go to school here. Tweeting live about an event is how I show residents that I don’t sit behind a desk all day. I am in the community attending events and supporting local merchants. Social media is a part of my job now. Approximately 60% of my followers are residents and 40% are businesses and other local government. It’s free so the return is great. Wessler: Why would you encourage your counterparts to begin using Twitter or other forms of social media? Grant: Although Twitter only takes 30 seconds to communicate in 140 characters or less, not many town managers are using it. I think mayors, town managers, councilmen, etc. would all benefit from this free resource. Nowadays, people get information from their phones; it’s just the way it is. In our positions, we need to be “turned on, plugged in, and jacked up”. We have to change with the times and meet others halfway. Social media aids in my mission to make Brownsburg the best community it can be, and I think it could help others also. I believe if something is going to give you a valuable result, you have to put in the time. Wessler: What tips do you have for a community considering Twitter? Use Twitter to get the correct information out there. In the absence of information, people will make it up. Market events, such as the Pumpkin Smash Bash, to let residents know what is happening. Use Twitter to update residents on town hall meeting locations, times, etc. Encourage questions and comments. This lets people know you’re a real person; all the comments I tweet are my own. Take the time to respond to questions tweeted. Tweet daily. On average, I send 8–10 tweets per day. Sometimes I only spend 15 or 30 minutes a day; other times I might spend a little more. Wessler: Do you encourage others in Town government to use social media? Grant: Yes, I encourage people in the Town Hall to use Twitter; it’s a good way to show you’re involved. Councilman Rob Kendall and I play off each other’s tweets often, which shows unity and vision within the community. Brownsburg is a growing community. We have 22,000 residents and not everyone knows each other. We aren’t small anymore. Social media platforms, such as Twitter, connect our town in such a way that allows us to have that small town feel we want. If you use social media, please share with us the benefits you have found from becoming social. If you are interested but are unsure of how to begin the process of setting up your accounts, we recommend you download Spinweb’s ebook on the 3 step process to effective social media accounts. Follow this quick and easy guide to connect with your community today! As Town Manager for Brownsburg, Grant Kleinhenz is responsible for economic development. He directs the day-to-day operations of the Town in carrying out the policy directives of the Town Council. In the Town Manager's Office, and throughout all of our departments, we strive to deliver the best possible services to our community. We are dedicated to our organization's values of responsiveness, integrity, passion, innovation and partnership.